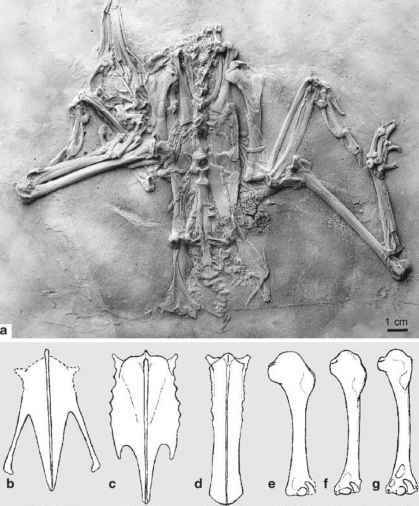 The middle Eocene Salmilidae comprise a single species, Salmila robusta Mayr, 2000, whose description is based on three skeletons from Messel, two of which are exceptionally well preserved (Fig. 13.5; Mayr 2000e, 2002e). 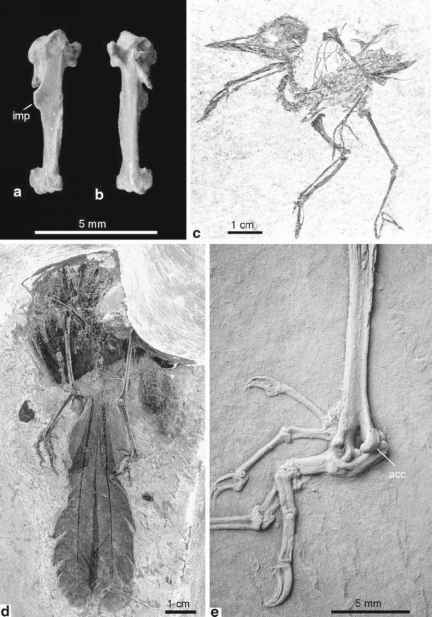 In the collection of Forschungsinstitut Senckenberg there is also an as yet undescribed skeleton of a juvenile bird, which may belong to this species (see Fig. 4 in Peters 1989). S. robusta reached about two thirds of the size of the extant Gray-winged Trumpeter (Psophia crepitans; Psophiidae), but had much shorter legs. Its phyloge-netic affinities have not yet been convincingly established, and the species shares derived characters mainly with the Cariamae and the Psophiidae, whose limb bones are fairly similar. As in these extant taxa the carpometacarpus is short and with a bowed minor metacarpal, whose proximal end bears a small tubercle on the ventral margin. In contrast to the beak of extant Psophiidae and all Cariamae whose skull is known, however, the beak appears to have been schizorhinal. Unlike extant Cariamidae, the Phorusrhacidae, and Elaphrocnemus, it further lacks well-developed supraobital processes. The limb bones have a robust appearance, and apart from the more rounded deltopectoral crest, the proportions of the humerus are similar to those of Elaphrocnemus. The caudal margin of the sternum exhibits a single pair of very deep incisions and the bone is thus unlike the narrow sternum of the Gruoidea (Fig. 13.5). The distal tibiotarsus probably lacks an ossified supratendinal bridge (this is not clearly visible in the fossils), which, if confirmed by future specimens, may indicate affinities to the Ameghinornithidae (Sect. 13.4). The tarsometa-tarsus is rather short and indicates that in contrast to most Cariamae S. robusta was not a cursorial species. Also unlike most Cariamae, the hypotarsus is not block-like but exhibits a distinct sulcus, which separates two hypotarsal crests. As in the Gruoidea but unlike in extant Cariamidae the proximal phalanx of the fourth toe bears a large medially protruding projection. Two specimens with well-preserved feather remains allow the recognition of a long tail, similar to that of extant Cariamidae, whereas the tail of the Psophiidae is very short. The postcranial osteological features of S. robusta correspond best with those of Elaphrocnemus, and a phylogenetic analysis resulted in a sister group relationship between S. robusta and a clade including Elaphrocnemus, Idiornis, Phorusrhacidae, and Cariamidae (Mayr 2002e). However, this analysis included a restricted character and taxon sampling and supported nonmonophyly of the Gruoidea, which can no longer be upheld (Chap. 3).